Back in the late 80s I went through a big Cajun phase, slowly and haphazardly educating myself by reading liner notes. Like many others at the time, I got hooked first on zydeco—via Buckwheat Zydeco (who experienced a huge mainstream bump via the soundtrack from The Big Easy), Clifton Chenier, and my favorite, Boozoo Chavis—but that stuff started me down a road that led me to the Cajun sounds of Iry LeJeune, Nathan Abshire, Bois Sec Ardoin, and Canray Fontenot. There was something innately soulful in their wild, shouted vocals, as well as in the heady interweaving of accordion and fiddle on so many of the records. It wasn't long before I hit on the root source—the scant output of accordionist and singer Amede Ardoin. Back then I bought a terrific vinyl release on Arhoolie Records, but to be honest, as much as I appreciated and understood Ardoin's importance, I wasn't quite ready for the rawness of the recordings. 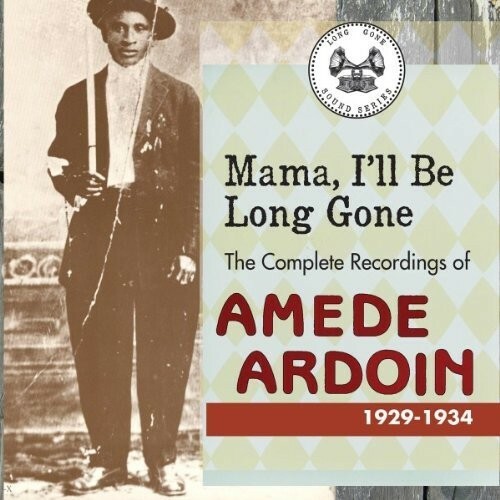 Earlier this year Tompkins Square released the definitive Ardoin collection, a double CD called Mama, I'll Be Long Gone: The Complete Recordings of Amede Ardoin 1929-1934, and this time I'm prepared to enjoy Ardoin's art. Ardoin is one of those mythical geniuses of American music—a guy like Robert Johnson and Charlie Patton, about whom very little is known but whose music has resonated far and wide. There's only one surviving photograph of him, and no one seems to know the exact date of his death (he was born on March 11, 1898); it's generally surmised that he died in the early 1940s in the asylum where he ended up a couple years after suffering a severe beating, which is generally thought to have happened in the late 30s. (The attack is a large source of his myth.) At the time blacks and whites often mixed in Louisiana in a way they didn't in other parts of the south—most of Ardoin's recordings feature the great white fiddler Dennis McGee—but he was still a trailblazer, and that meant risk. The story is that Ardoin went too far at one particular house party: during a break from performing he dared to wipe his face with a handkerchief offered by a white woman. On his way home later that night he was attacked by a few visitors from the party (who were supposedly from out of town and offended by the racial mixing in Eunice, Louisiana); he was then struck by a car as he tried to stagger home. Michael Tisserand's book The Kingdom of Zydeco digs deeper into other possible explanations: that a jealous black musician poisoned Ardoin, or that the handkerchief story arose as a metaphor for the fact that Ardoin was actually doing a lot more than borrowing hankies from one particular white woman. The 34 tracks included in this set were cut in New Orleans and New York, but Ardoin remained a huge star in Louisiana after his last sessions in 1934, supporting himself with his music. These recordings are technically Cajun music, but Ardoin planted the seeds for zydeco with his rhythmically aggressive playing and emotional singing, which brought a preternatural bluesiness to just about everything he cut. The modestly packaged set features keen graphic design by Susan Archie and typically excellent liner notes from Christopher King. Below you can hear one of Ardoin's most enduring classics.